Launched in 2005, the Tradition, contrary to its name, was a very avant garde and fresh take on Abraham-Louis Breguet’s legacy. Inspired by the movement architecture of Breguet’s Souscription watches of the late 18th century, this 21st century homage gives center stage to the movements of yesteryear by placing what is habitually on the back, on the dial side. 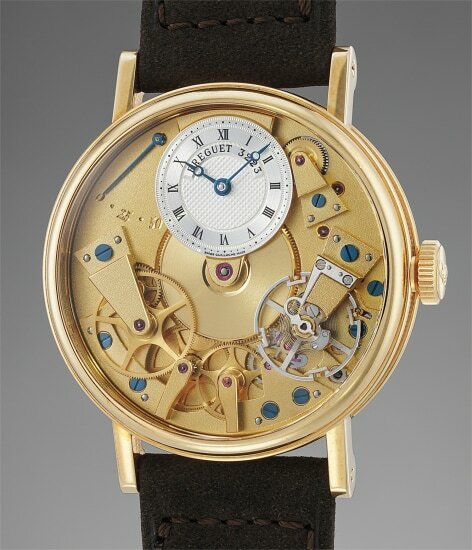 The dial side reveals the escapement, a large part of the gear train and the mainspring barrel all with a gilt finish reminiscent of the original Breguet movements. A power reserve indication is elegantly placed on the back. A wonderfully elegant timepiece, the Tradition manages the perfect balance of creating an homage piece while remaining creative and extremely modern.